Soft, doughy, light-hearted bread. Once just an innocent member of the food family that graced most of our plates every day. Bread used to conjure up religious, traditional and symbolic connotations. Today? Bread = bad. Bread = destroyer of all diets. Bread = bloated gut. Poor bread. He’s really had a tough go of it since we entered the 21st century. The cold, hard truth is that bread is (in most cases) simply not what it used to be. Why? Well, our grains (in most cases) are not what they used to be. Farming practices have changed, commercial products have crap in them and big businesses have changed a traditional food into something that doesn’t sit well with many people. In addition to that many people have food sensitivities to grains or gluten. But the other side of the story? Not all bread is bad, and not everyone needs to avoid it 100% of the time. If you can live a life with some bread in it and still feel great, well then, my sweet friend, have some bread. LIFE IS SHORT. Turkey sandwiches are delicious. The end. JK, not the end. So which bread to eat? We get this question a lot, people want to make the wisest choices they can for them and for their kids. Is there a preference on whole grain vs. whole wheat? Gluten-free vs. non-gluten-free bread? How do we know what makes it healthy? Let’s dig into the gritty details on bread. Public Service Announcement: for the most part, bread includes some level of refined flours – whether they’re gluten-free or not. And this is why we don’t lean on or have bread all that often, because refined flours are what spike our blood sugar levels and, long story short, get broken down as sugar in our body. For people who are sensitive to carbs or who put on weight easily, that can be an issue. But enjoyed in moderation, totally fine! You’ll notice (even with some of our favorites) that they often sneak in some added sweeteners, but ideally, these are natural sweeteners. 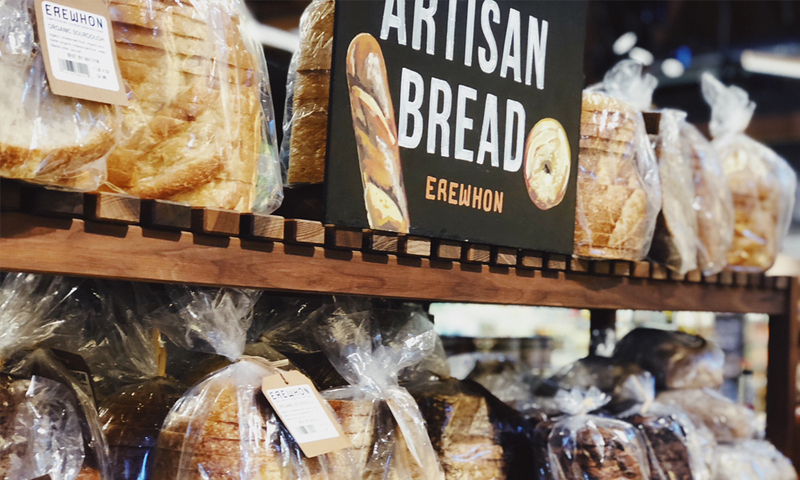 Try to always choose bread made with organic ingredients – the wheat that is used to make most bread is heavily sprayed with pesticides and high levels of GMOs. When in doubt, always reach for the bread with most whole grains and least amount of ingredients. Not everyone needs to be gluten-free! That’s why it’s so key to explore if you’re sensitive to it! Gluten-free does NOT equal healthier, there are plenty of packaged foods, including gluten-free bread, that is the same processed crap as the other stuff. Sorry, Charlie, it’s just the truth. Canyon Bakehouse 7-Grain Bread – Includes whole grains and is straight up delicious. You guys…you don’t even have to toast this gluten-free bread to make it edible! Hands down. Bread SRSLY – Megan’s direct quote: “easily the best gluten-free bread I’ve ever had. It’s hard not to eat the whole loaf – but it’s only west coast and it’s $10 a loaf.” So, you’ll be broke, but happy. Three Bakers 7 Ancient Grain Bread – This one leans heavier on whole grains as opposed to refined flours so it’s a more fiber-rich option, and is another one of Megan’s favs. Grindstone – This stuff is HEALTHY. Ancient grains, seeds, protein and fiber-rich, NO gross ingredients. We love it. It’s not traditional like light bread, but amazing toasted and as a vehicle for spreads. Happy Camper’s Bread – Classy Grains – Soft, chewy, makes for a lot of happy campers. All of their breads are delish! Manna Gluten-free Ancient Grains – We can get behind ALL the ingredients in this bread. Can You Tolerate Gluten Just Fine? Awesome! We are definitely NOT anti-gluten. Like I said not everyone is sensitive to it. So what are your best options in this category? Go for sprouted and whole grain – these are the easiest to digest and pack the most punch (of nutrients). Unfortunately whole wheat does not = whole grain. Keep in mind all refined white and wheat flour generally will NOT be a smart option when trying to feel your best. Ezekiel Bread – Original Sprouted is an awesome option – it’s made up of six different organic sprouted grains. Boom! Dave’s Killer Bread – Sprouted Whole Grain is another good option. There is some added sugar but it’s packed with sprouted whole grains so we’re letting it slide. Alvarado St. Bakery Sprouted Multi-grain: We love this bread! Kids love it too. We hope this list can help you create an epic picnic next Saturday with your loved ones. I’ll be having turkey with extra pickles thank you. Hold the dijon. After studying the intricate connection between food and chronic illness, Megan Morris co-founded Prescribe Nutrition, a nutrition company dedicated to helping people restore their relationship with food and uncover the diet that works best for them. Megan is particularly passionate about the links between food, digestion and helping people feel better. She lives in San Francisco with her dog Fozzie Bear.